The treatment of cancer pain is often among the approved uses of medical cannabis in states where it is legal. ∆9-THC, the active ingredient in cannabis, acts on both of the cannabinoid receptors CB1 and CB2 and is associated with negative side effects such as dizziness, psychoactive effects, and dependence, which are thought to result from the activation of the CB1 receptor. While the majority of cannabis-like molecules have some activity at both CB1 and CB2 receptors, one that is selective for CB2 could potentially exhibit therapeutic properties without the side effects associated with ∆9-THC. 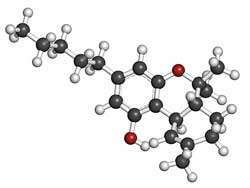 THC (delta-9-tetra- hydrocannabinol, dronabinol) cannabis drug molecule. In this study, the authors looked at whether the CB2-selective molecule AM1710 could reduce neuropathic pain caused by the chemotherapy drug paclitaxel, while avoiding unwanted side effects. Mice that were given ∆9-THC to treat paclitaxel-induced pain developed tolerance to the drug, so its pain-relieving properties diminished. After discontinuing ∆9-THC, the mice also experienced withdrawal symptoms, indicating the development of drug dependence. In contrast, AM1710 was able to relieve neuropathic pain, but without inducing either tolerance or withdrawal. This ideal clinical profile of pain-suppression in the absence of tolerance or dependence risk suggests that CB2 receptors could be a viable target for development of pain-management drugs that avoid adverse outcomes of cannabis use. Chronic cannabinoid receptor 2 activation reverses paclitaxel neuropathy without tolerance or cannabinoid receptor 1-dependent withdrawal. Deng L, Guindon J, Cornett BL, Makriyannis A, Mackie K, Hohmann AG. Biol Psychiatry. 2015 Mar 1;77(5):475-87. doi:10.1016/j.biopsych.2014.04.009. Epub 2014 Apr 25. PubMed PMID: 24853387; PubMed Central PMCID: PMC4209205.